Jeff "Spanky"Amlotte came to Mamrelund from Hope College in 1998. 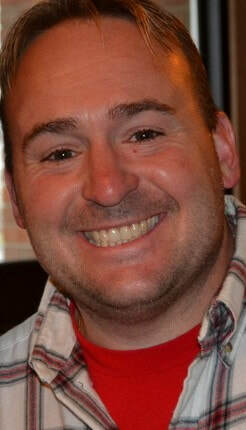 Jeff is responsible for the faith formation and activities of the Jr. and Sr. High Youth. He leads Confirmation classes with Pastor Mike and leads the Praise Team at the Contemporary service. He is involved in the community where you will often find him at the schools visiting with the youth and in the community theater. Another of his duties is working with the Christian Education Ministry. He is a longtime advocate of Cross-Generational faith formation. Our bi-monthly MAMFAM is an example of his efforts in this area. Jeff brings energy and passion for the Lord and is excited about the future of Mamrelund. He is married to Jen and has three children: Allie, Ben and Samuel. He is an avid sports fan and has coached many local teams. He is "the Lions fan" and has a shrine in his basement dedicated to his team. This should show you that he never gives up on people and has a love for the Gospel.